The entrance looks rundown and in need of repair (or at least of dusting). 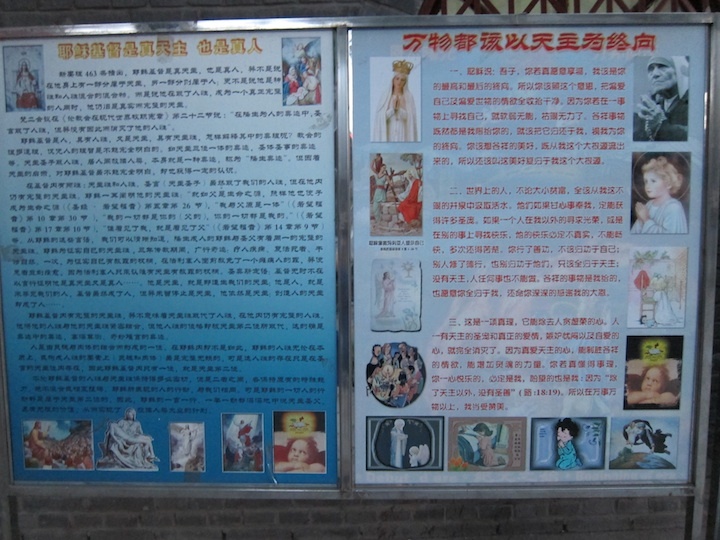 The two signs on the right side of the door states the status of the cathedral: the Seat of the Beijing Diocese and the Catholic Patriotic Associatioin of Beijing. The chapel was first built and established by the Italian priest Matteo Ricci in 1605, who dressed in Chinese robes and converted government officials speaking the local language.In 1650, expansion work began under the leadership of the German Jesuit Johann Adam Schall von Bell. 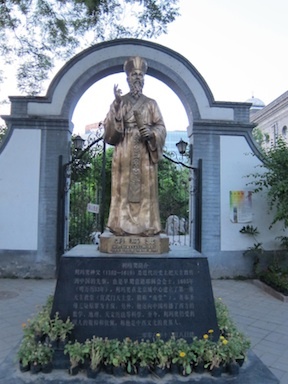 In 1690, Beijing received its first Roman Catholic bishop, the Franciscan Bernardin della Chiesa. 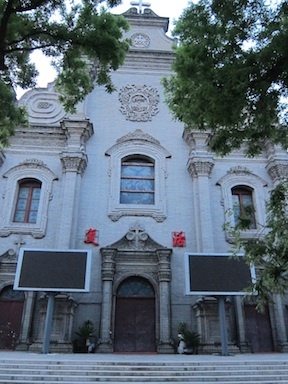 From then now, it became a cathedral and served as the seat of Beijing’s Catholic community. A statue of Matteo Ricci adorns the entrance into the cathedral. 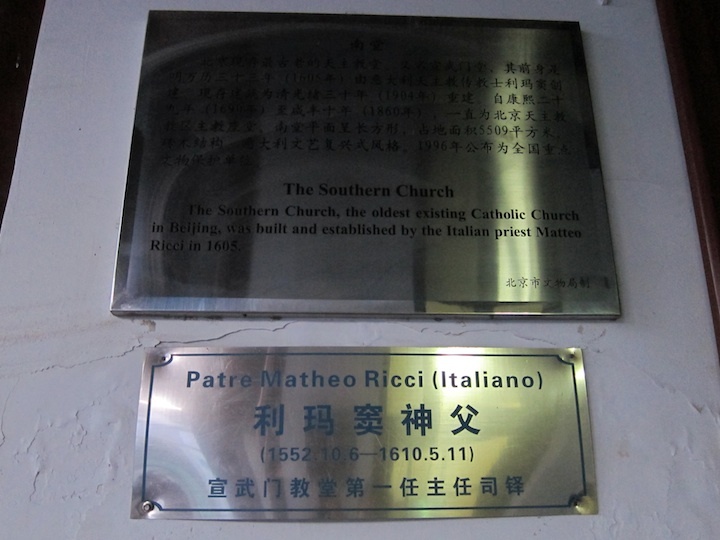 The introduction plate of the cathedral and Matteo Ricci. The cathedral was twice destroyed in 1720 and and 1730, but was repaired. 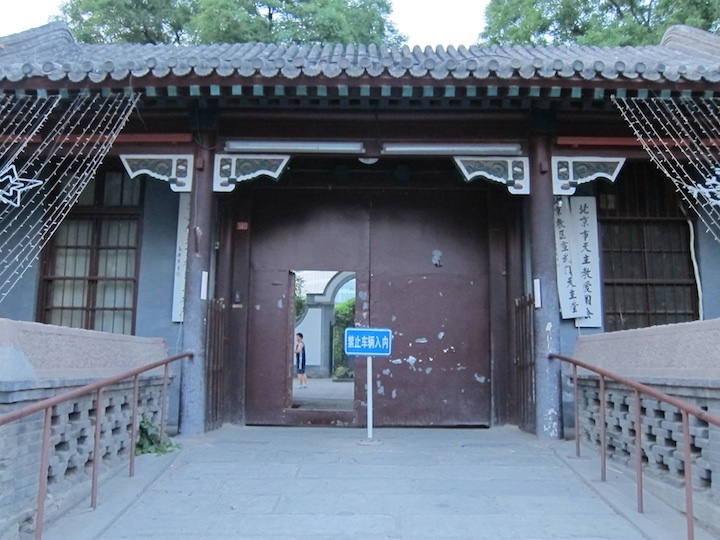 It was damaged again by fire in 1775, and was restored by the Emperor Qianlong. 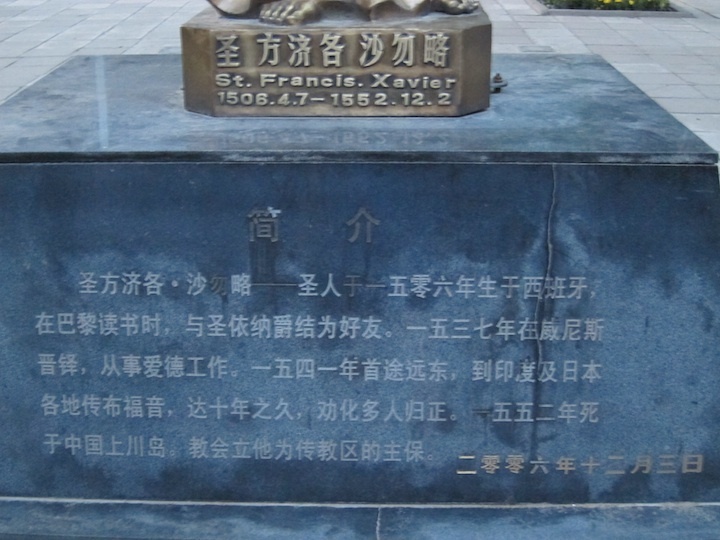 In 1838, Emperor Daoguang decreed a restriction of activity of the Catholic churches in China due to conflicts of the church and the people. 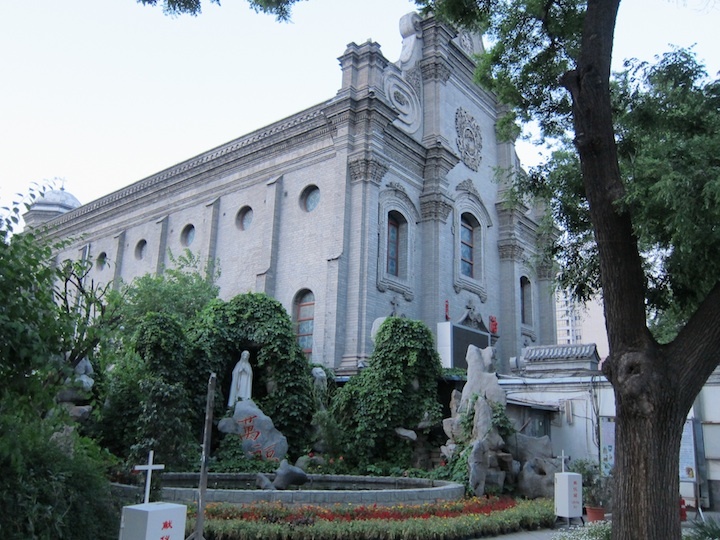 After reopening in 1860, the cathedral was burned to the ground by the Boxer Rebellion. In 1904, the present-day structure was rebuilt on its original site. All activity was paused during the Cultural Revolution, and in 1979, Bishop Michael Fu Tieshan was consecrated in the cathedral, marking the beginning of new life in China. The cathedral is small by European standard, but is in the baroque style of the time. The public display window is filled with basic Catholic beliefs explained in simple language and colorful photos. Pictures from Singles Night held by the Cathedral are also displayed. 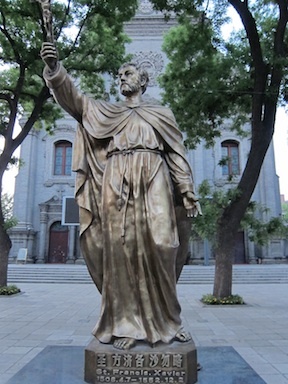 In front of the cathedral, a statue of Saint Francis Xavier stands to testify the history of the place. View of the Cathedral from the side. May I just respectfully ask to whom should I inquire about retreat/recollection schedule in Beijing. I am a Filipino with Chinese friend residing in Beijing. She would like to know more about Christianity and how Jesus lives. I would be very grateful if I could refer our church to her. May the Lord God provide the necessary strength so that you may continue serving Him by loving your brethren. More fruitful ministry ahead! Have a blessed weekend. what time is the daily mass? The book chronciles the Good News Since the 2007 release of The Tide is Turning. The rise in orthodoxy from increases in vocations and devotions, to the Church front and center in the 2012 political and election year debate. All will be covered in this 378 page book that delves into the decline of liberal Christianity and mega church mania and what this tells us about accomodation with militant secularism and whimsical religious fads. The book will look at a number of topical issues and why the Church is gaining even as she is the target of the mainstream media and those beholden to the whims of the modern world. I shall be visiting in October 2015. What are the times for Mass on a Sunday please? My name is Mila. I got job in Beijing. I will arrive to China on October 6 and will live there for a year. 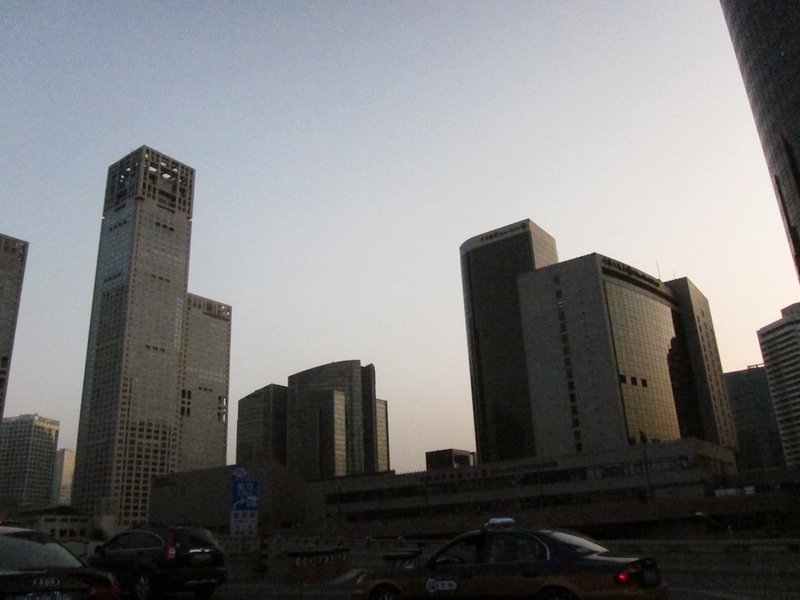 I have never been to China before, and as a total foreigner, I need some help. Please, if you could help me find a place where I could stay. I will pay rent, I am honest Christian. I dont smoke, don’t drink. I am a member of Church, my father serves at Church. 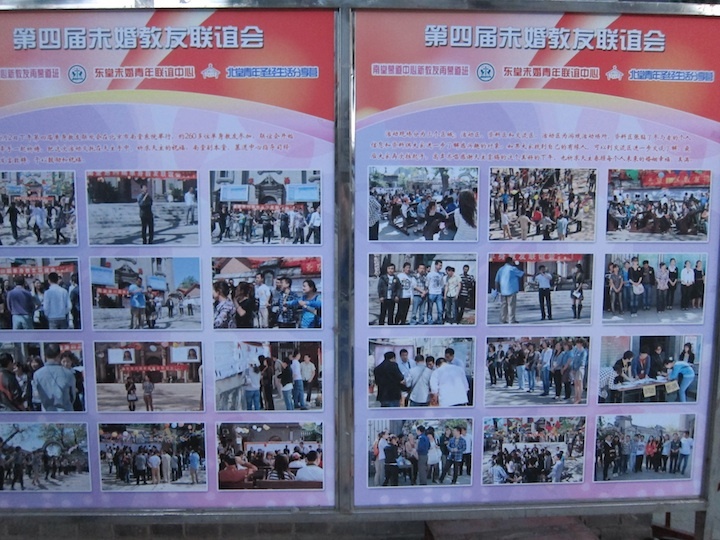 At our Church, we always pray for persecuted Christians in China and other countries and ask the Lord to help them. I pray and ask the Lord to help me find Christians to stay with. I know there are many rooms where I could stay, but my greatest desire is to stay with Christians. Faith is very important for me. Dear pastor or whoever is reading this email, I ask you if you could talk to people from your church and ask them if they can help me find a good christian home to stay or (if its not possible) recommend a good safe place with good people. It can be private room or shared room, doesn’t matter.